What an incredible time we had with Astronaut Charlie Duke and his dear wife, Dotty. Together, they shared the love of Jesus and His message of hope and life with almost 300 people. Six people prayed to receive Christ and several more indicated an interest in learning about a personal relationship with Jesus. 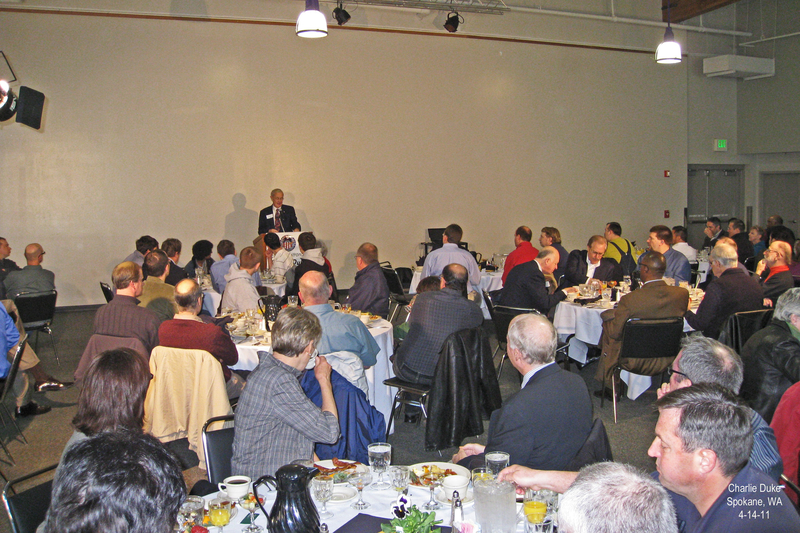 Chris’s dad took photos of the businessman’s breakfast, Ron Hauenstien videotapped Dotty speaking at the Wive’s Luncheon, and Tami Siriani took photos of the military event. I wish I could share all the memories I have of an amazing time, but trust you’ll enjoy the moments that were captured. We want to express a special thanks to Tami Siriani of Siriani Photography for donating her time and the images from Charlie’s time at Fairchild Air Force Base. 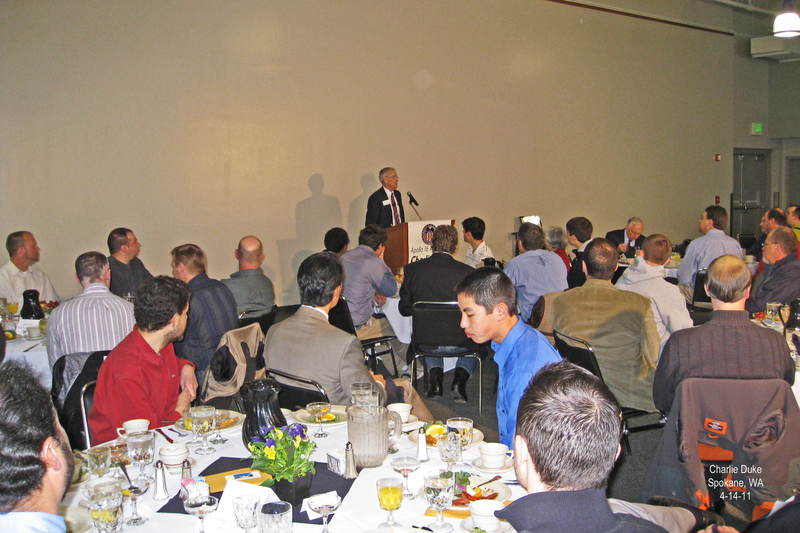 Breakfast with Apollo 16 astronaut Charlie Duke in the Champion’s Room at the Spokane Arena. 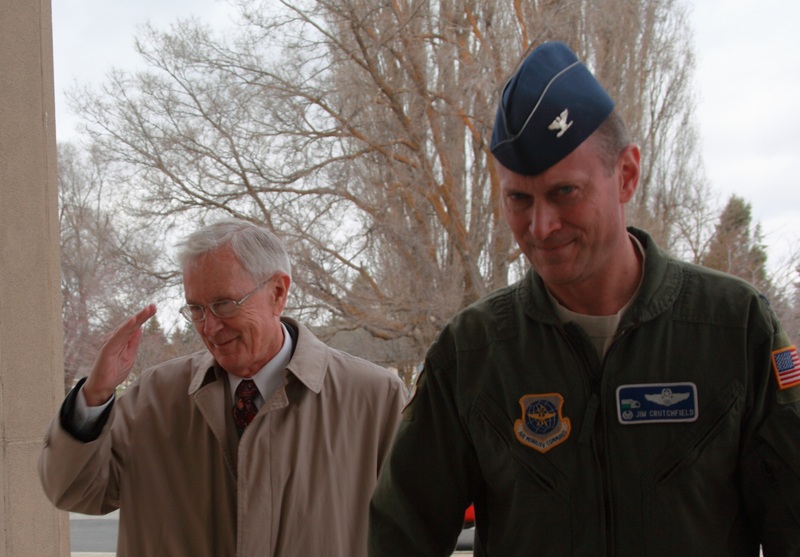 Apollo 16 astronaut and retired Brigadier General Charlie Duke greeting airmen as he arrives at the base theater. 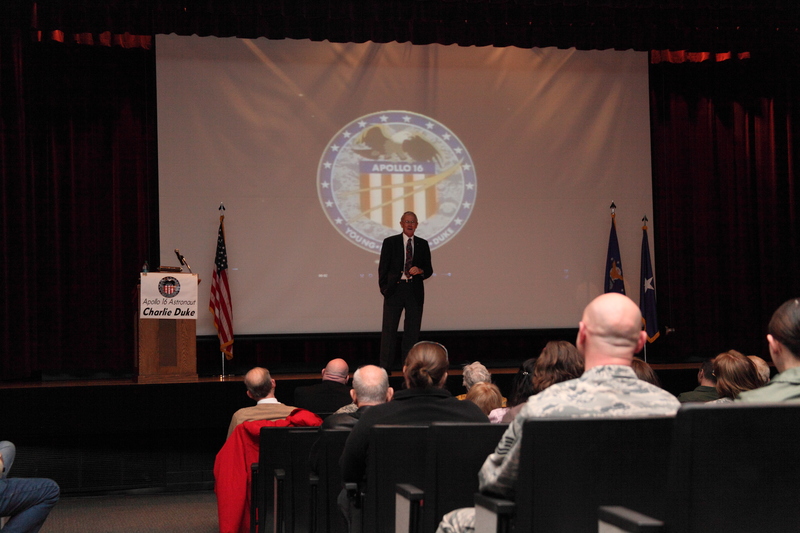 Apollo 16 astronaut Charlie Duke addressing military personnel with the Apollo 16 mission patch in the background. 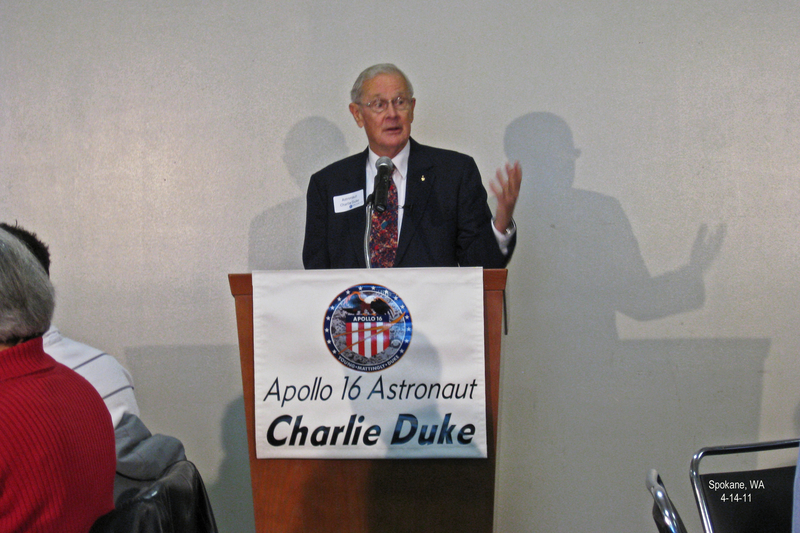 Apollo 16 astronaut Charlie Duke with the Apollo 16 mission patch in the background. 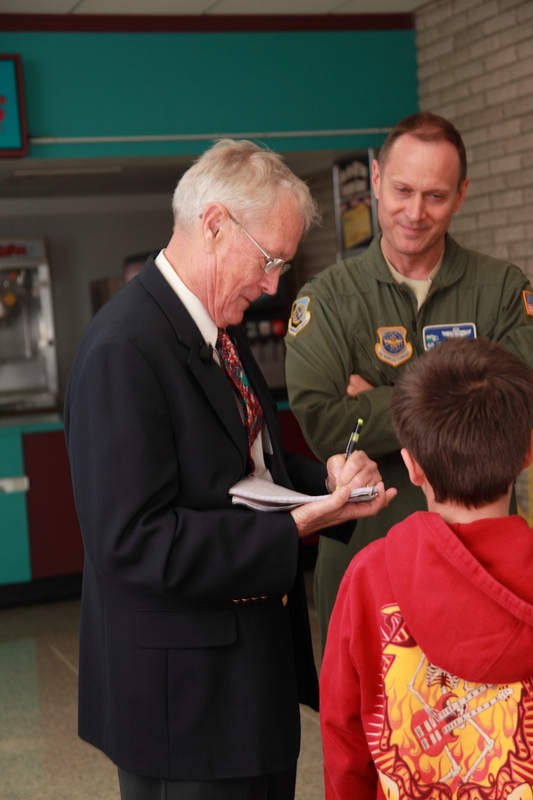 Apollo 16 astronaut Charlie Duke poses with the airman who won a drawing for an autographed photo of Charlie on the moon. 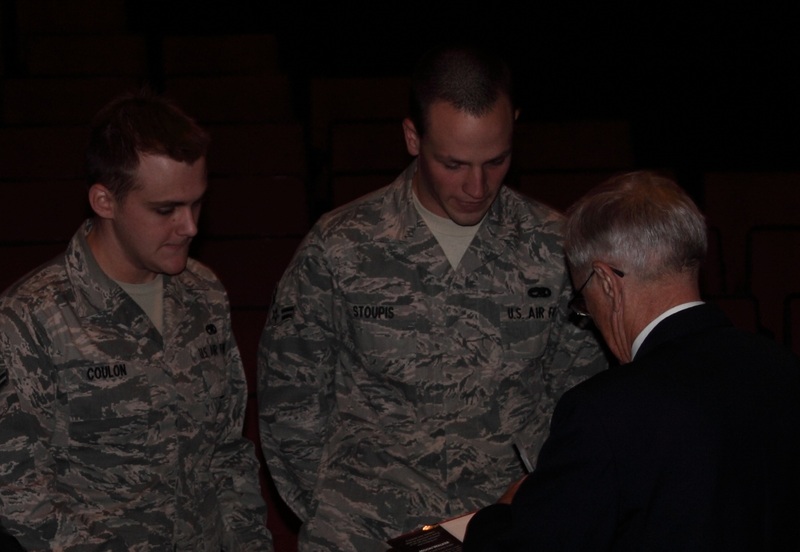 Apollo 16 astronaut Charlie Duke chats with airmen after sharing his story. 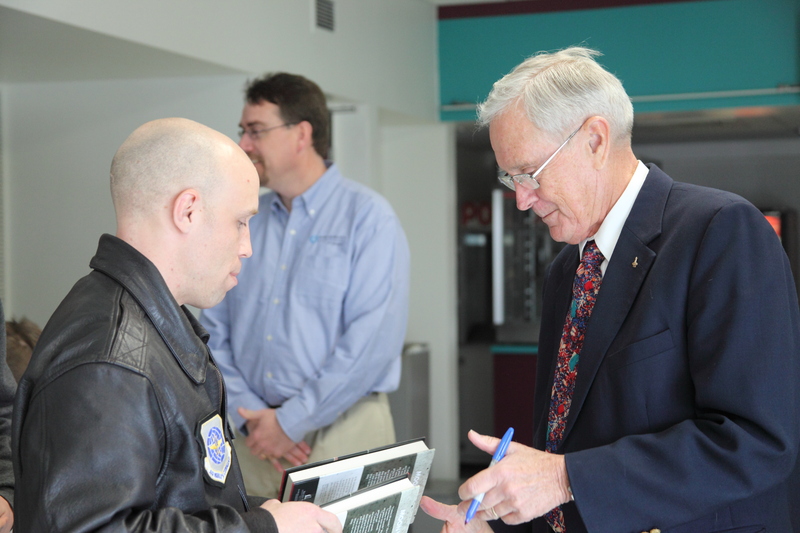 Apollo 16 astronaut Charlie Duke autographing books for guests who came to hear his story. 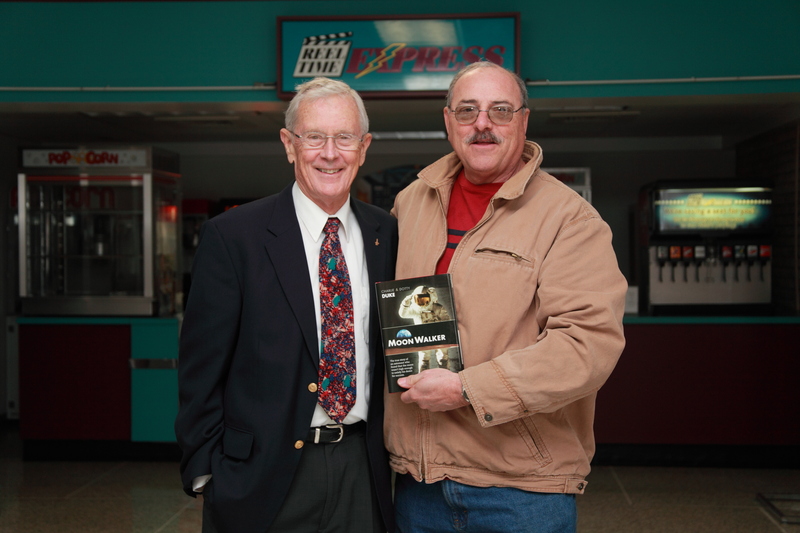 Apollo 16 astronaut Charlie Duke with a gentleman who purchased a copy of his book. 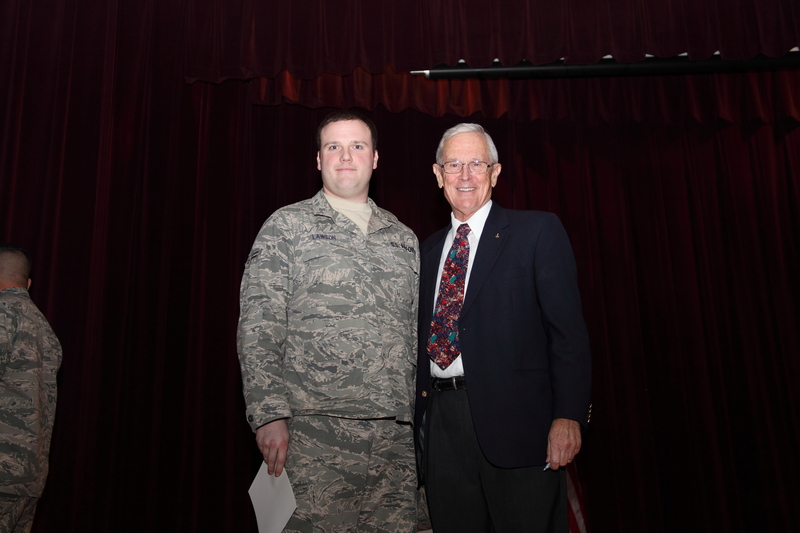 Apollo 16 astronaut Charlie Duke with airmen after sharing his story in the theater on Fairchild Air Force Base. 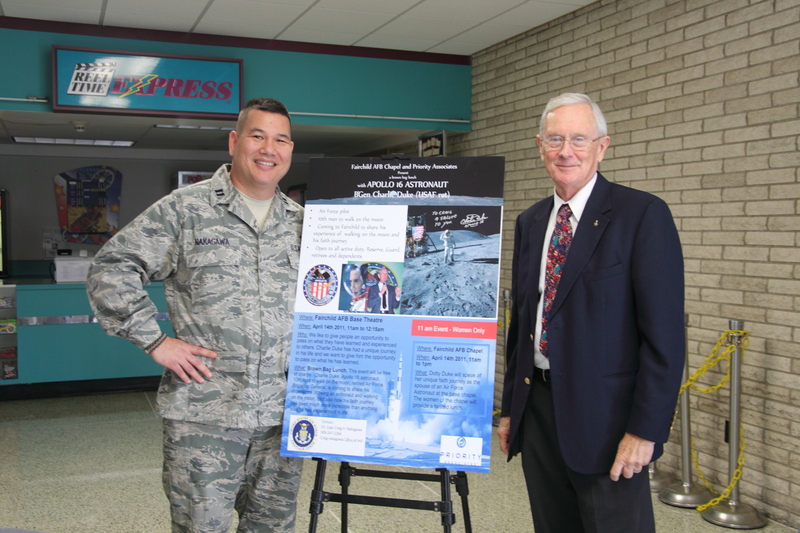 Apollo 16 astronaut Charlie Duke with Chaplain Nakagawa in the theater on Fairchild Air Force Base. Chris has followed up with most of those who responded, with exciting results. All together, seven gentlemen will be meeting with him over a four week period to go over foundational information about a relationship with Jesus. Chris has also provided follow-up material for two families who had teens make a first-time decision for Christ. And, one gentleman will be meeting with Chris so he can learn how to disciple his friend who prayed to receive Christ with Charlie. What a huge blessing to see God at work in the lives of people here in Spokane. We took JJ to see Tami Siriani, the amazing photographer who took our family photo last fall. She captured some darling pictures, don’t you think? It is hard to believe the “Walking on the Moon, Walking with the Son” is over. April 14 was the culmination of almost a year’s worth of planning. The Gospel was proclaimed, hearts were touched, and lives were changed for eternity. Wow. More than the numbers, though, are the stories of changed lives, which we’ll be sharing with you in coming weeks. 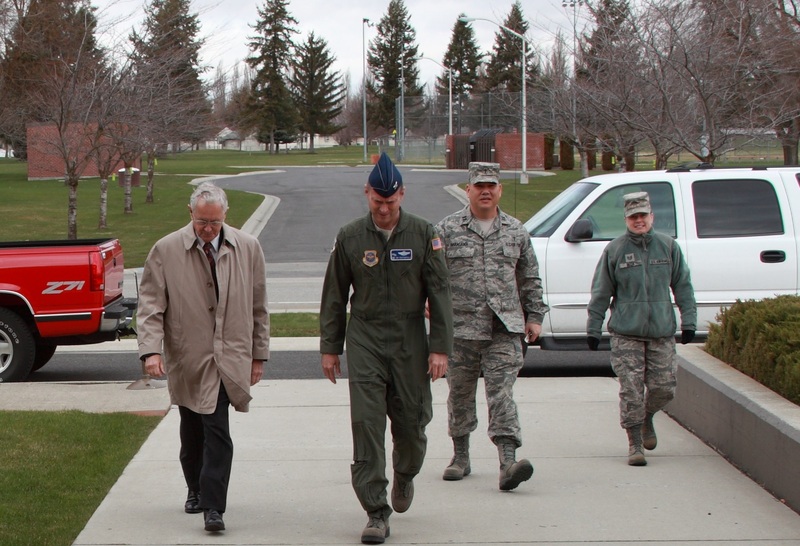 And, we’ll be posting photos from the events of April 14 as soon as we can. We’ll also have information on future events as well as community service projects you can be part of. So, be sure to check back often for more details. Only a week remains until Astronaut Charlie Duke arrives to share about his experience of walking on the moon and walking with the Son!! One of just twelve men to walk on the moon, an opportunity to meet and have breakfast with Charlie Duke right here in Spokane is truly amazing! 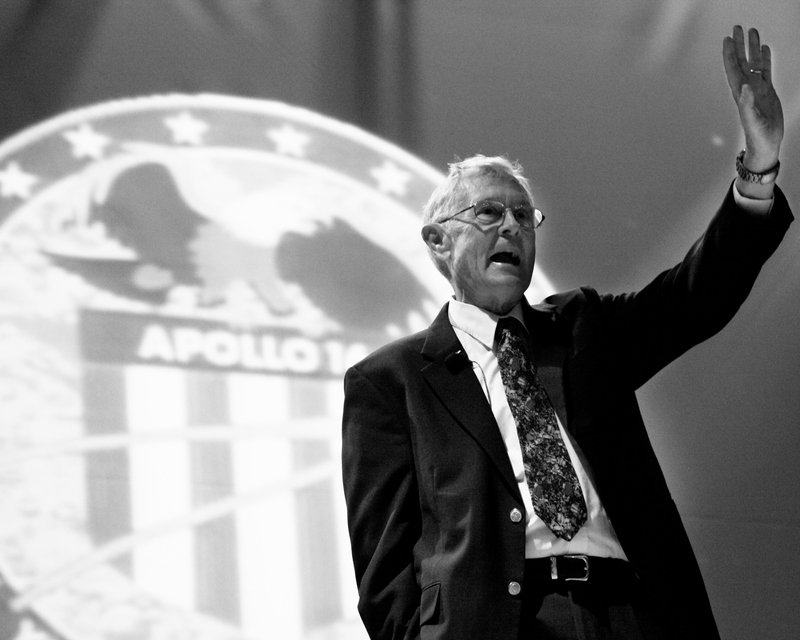 And, more than sharing about what it was like to actually walk on the moon, Charlie Duke will be sharing with us why his relationship with God tops walking on the moon. 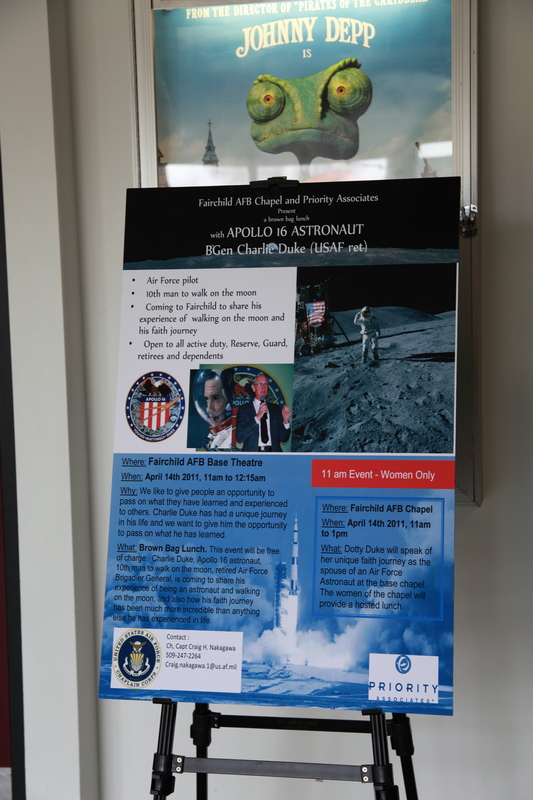 If you want to hear an American hero share about his amazing accomplishments and why he finds significance through his faith in God rather than his walk on the moon, please visit http://priorityassociates.org/eventdetail.aspx?id=72 to register.